This book-and-DVD collaboration from a gifted Bible narrator and an award-winning writer shows how churches can train their laypeople to "unleash the Word of God" while reading the Scriptures, whether during worship, in small groups, or at home. Straightforward and culturally relevant, it helps people proclaim the Bible in a way that communicates its life-changing power! ^^^Modern society is awash in words. An auditory tidal wave cascades from our televisions, radios, media players, and the Internet. Today's distracted worshippers often feel spiritually shortchanged when the Scriptures are spoken without passion and power. ^ ^This lively and encouraging resource is the collaboration of a gifted Bible narrator and a mentor to church leaders. In it they show how churches can train their own teams of Scripture readers. 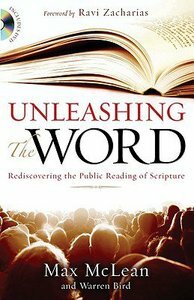 These laypeople can - with enthusiasm, conviction, and passion - "unleash the Word of God," and prepare hearts to receive the message. An illustrative, lively, multi-session DVD that brings the book's lessons to life is included. ^ ^Spoken well, the Word of God opens and penetrates the listener's heart. Simple, straightforward, and culturally relevant, this book-and-DVD combination provides the necessary tools to teach you how to read the Bible aloud, in a way that communicates its life-changing power! Does the Bible sound dull when you hear it read in church? An auditory tidal wave cascades from our televisions, radios, media players, and the Internet. Today's distracted worshippers often feel spiritually shortchanged when the Scriptures are spoken without passion and power. This lively and encouraging book-and-DVD set, the collaboration of a gifted Bible narrator and an award-winning writer, shows how churches can train their laypeople to unleash the Word of God with enthusiasm, conviction, and passion. Straightforward and culturally relevant, with practical how-to graphics, this resource provides the necessary tools to teach you how to read the Bible aloud, in a way that communicates its life-changing power! Max McLean is an actor/storyteller/communicator whose lifes work and passion is to make the Bible come alive for his audiences. He has presented the Bible as solo theatre events on stages around the world. His daily program of Bible readings is featured on over 500 radio stations on five continents. Warren Bird (Ph.D., Fordham University) has collaboratively authored nineteen books (including two 100,000 bestsellers, one Gold Medallion winner, and one runner up for the Gold Medallion), served as associate pastor for eleven years and senior pastor for four years, taught as regularly contributing faculty at Alliance Theological Seminary for twelve years, and served on the senior leadership team of three organizations that provide training to pastors - Charles E. Fuller Institute, Canadian Centre for Leadership Development, and the Beeson Institute for Advanced Church Leadership.